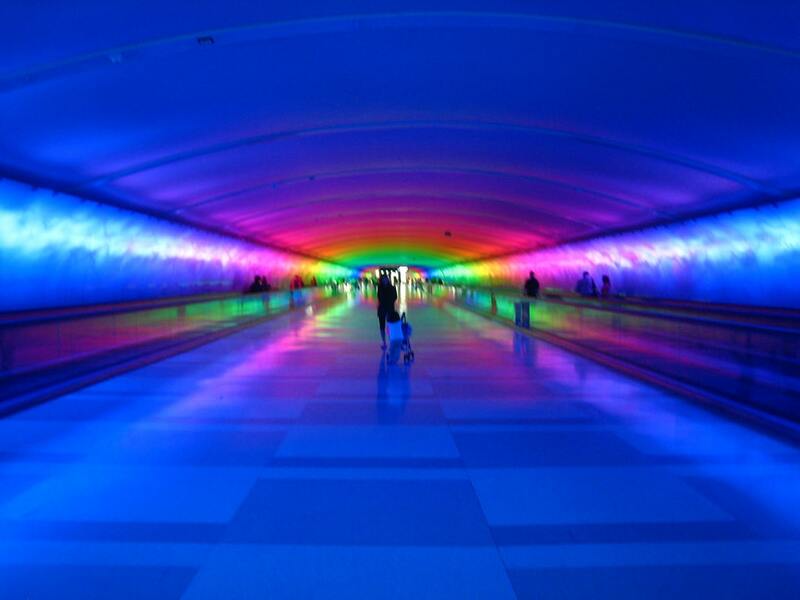 Have you ever been through “The Tunnel” at the Detroit Metro Airport? The McNamara Terminal at the Detroit Metro Airport has a 27 minute lighting masterpiece composed to a soundtrack – it provides an excellent and awesome spectacle of LED fury for those passing through. Marcus Wuebker, an old friend and fellow lighting designer from Mills-James, Inc in Columbus, OH was the LD. I asked him to write a few words about the tunnel, which he so graciously did (thanks, Marcus! ), and I’ve posted the article below. I hope you enjoy, as Marcus is a talented designer. The McNamara Terminal at the Detroit Metro Airport has a passenger tunnel that connects two concourses beneath the tarmac. Curved glass panels with abstract art sand blasted into the back create a mural on both sides that runs the entire length of the tunnel. Translucent material completes the curve of the glass and visually connects the two sides. The Smith Group is the Architect of record for that part of the airport and is responsible for the initial design. They created the space and specified the type and number of LED fixtures to artfully light it for a number of reasons including low maintenance and low heat output. Northwest Airlines then hired Mills/James Productions to evaluate the existing design and create a show for their passengers. The Smith Group’s concept was to light the back wall from above with 6 rows of Color Kinetics iCove 12” fixtures. This produced an interesting yet subtle look as the light reflected off the wall through the glass. After spending some time with the mock up at the Fox Fire Glass, I decided the best way to light the glass was to focus the iCoves directly at the glass and break each glass panel into 3 separately controllable areas vertically. I programmed a thunderstorm rolling in complete with some lightning strikes and when the glass artist, Laurel Fyfe, saw it her eyes lit up. It took her about a half a second to realize how this approach would work in the tunnel with 135 glass panels on each side. She was so excited the next 10 panels she carved had shapes that could easily be describes as lighting bolts, rain drops, and clouds. Back in Columbus, the composer, Victor Alexeeff, and I started discussing ideas for the show. I suggested a rainstorm and a sunrise/sunset themed piece. Victor had an idea for a space like piece that moved into the chaotic world of the infinitely small. Victor would write a piece, give it to me and I would program to it in WYSIWYG. After showing Victor what I could do with what he gave me, he would get excited and go back to his studio and create stuff with music and sound effects just so I could put a cool lighting effect to it like a comet that shot all the way through the tunnel. My favorite part of the show is when two small “fireballs” come at you from one and of the tunnel, and then suddenly the entire tunnel is enveloped in fire from the other end. All of these ideas came down to two sections that totaled 27 minutes, Ethereal and Nature. The tunnel was programmed and runs today off of two Hog II PC’s. There are 8100 12” iCove Fixtures lighting the glass panels and 222 12” Color Blast lighting the ceiling and 12 48” Color Blaze in each rotunda all from Color Kinetics. Pathport Ethernet nodes distribute DMX throughout the tunnel. I would like to thank Northwest Airlines and Mills/James Productions for the opportunity, as well as the other Artists that make this a one of a kind project. Previous articleLook at this Little DLP! Do you have any idea if the soundtrack played in the tunnel is available to listen to on the web or is able to be purchased? I cant get enough of it! I sat in that tunnel for 2 whole hours before my flight. Its really inspiring and spirit lifting! Yes, where can you get the soundtrack???? Love walking through this tunnel! best part of the airport. LED tunnel light very much .Welcome to look at my website and blog articles.Hope we can become good friends, and exchange and to help each other! Thanks!! LED tunnel light very much . Thanks for posting the info on this. I went through this tunnel four years ago. It was the best part of my entire trip. We arrived at the Detroit airport last night totally frazzled. What a pleasure to experience the McNamara Tunnel! I found it fascinating, soothing, amusing all at once. This morning after a brief night in a hotel we experienced the tunnel once more. It reminded me to not take life so seriously, to enjoy the journey. And so I will! Thanks to the creative team for this artistic gift. A fantastic light show, the nicest I’ve seen since the monumental Xenakis laser show in the Cluny museum vaults, Paris, 1973. If only for a short time one has the sense of being transported into a utopian, cosmic future… I didn’t want to leave…I too would like a copy of the music! I lived in Detroit for some years but just recently got to experience this tunnel on my last stopover flying from Seattle to Cleveland. I was utterly mesmorized and had to go back through the tunnel several times. I questioned a maintenance employee about the artists who created this work of art and he pointed out a bronze placard with that info. I wish I was wealthy enough to have similar artwark in my home (granted I live in a small apartment). I love glass art, lighting effects and New Age music. What a sensation.